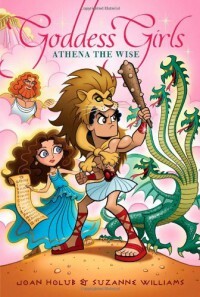 I really like Athena in this story. I expected her to be bossier, thinking she was better than other people because she's the GoddessGirl of Wisdom, which is brought up several times in this book. Rather, she seems to be embarrassed by it. She helps Heracles, not just because her father requested it, which he did, but in the end, because she wanted to. I think she'd be a good friend. I like that she always thinks her way out of problems instead of using Heracles' methods of violence and force. The only time she really acted out of anger, which seems very unusual for her, is with Arachne, whom sort of deserved it. However, I don't know that the punishment fit the crime, which is exactly what she was telling Ms. Nemisis. She just didn't follow her own advice.